More than 2,000 people died in English hospitals last year due to lapses in patient safety, a watchdog says. 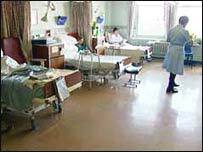 About 980,000 patient safety incidents and near misses were reported in the NHS, the National Audit Office found. But as many incidents are not reported, the numbers of deaths, which are already higher than previous estimates, could be even higher, the study said. The government said while the majority of mistakes were minor it was important the NHS learned from them. But the study found about half the incidents in which a patient was unintentionally harmed could have been avoided if lessons from previous incidents had been learned. The cost of the mistakes to the NHS was estimated to be £2bn a year in lost bed days on top of the costs of litigation, according to the NAO. The survey of 99% of NHS trusts revealed there were 2,081 deaths reported from April 2004 to March 2005 - more than double the 840 figure given by the National Patient Safety Agency (NPSA) in July. The total does not include hospital acquired infections. NAO head Sir John Bourn said: "There needs to be significantly faster progress at the national level in ensuring effective evaluation of numbers, types and causes of incidents. "And lessons and solutions must be better evaluated and shared by all organisations with a role in keeping patients safe." The report found falls were more likely to be reported than medical errors and near misses. Other errors made included medication errors, equipment defects and patient accidents. Doctors were the least likely to report an incident, the NAO said. Two thirds of incidents resulted in no long-term harm. The NAO said a "blame culture existed" and called for the development of an effective safety culture in which employees need not fear blame or unequal treatment if they report incidents, and for patient safety to become a core part of professional clinical training. Conservative MP Edward Leigh, chairman of the committee of public accounts, said "no public health system should tolerate a failure to learn from previous experience on this scale". He said: "It is unacceptable that any NHS staff member might be too afraid to report things going wrong." And he added the findings called into question the performance of the NPSA which was set up to ensure lessons are analysed and learned from. Bill Kirkup, deputy chief medical officer, said: "The majority of these incidents are minor and have no lasting effect on patients. Regrettably, some are more serious. "We must investigate and learn from all of them, so that we can make systems safer and more reliable." But he said the NPSA was making the NHS a world leader in this. NPSA medical director Professor Sir John Lilleyman said trusts were developing a "more fair and open culture", but there was still much more to be done.